Throughout May, Northern Ireland seemed to be on the brink of anarchy. The Irish Republican Army (IRA) burned business premises across Belfast. Mansions were also attacked, including: Shane's Castle, Crebilly Castle, Glenmona House, Kilclief house, Garron Tower and Hawthorne Hill. Railway stations and flax mills in rural areas were set on fire. In Desertmartin, Co. Londonderry, after the IRA killed three policemen and burned a mill, seven Catholics were killed and the rest of the Catholic population were driven out of their homes. The Civil Authorities (Special powers) Act of 7th April gave additional powers to the Northern Ireland government. Special courts could detain suspects without trial for unspecified periods and impose sentences of penal servitude or death. The killing of W.J. Twaddell MP led to the immediate introduction of internment. 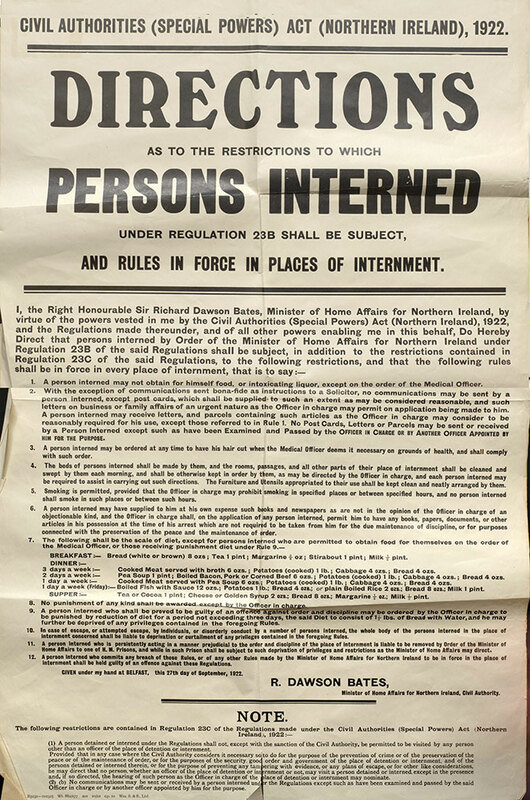 People were arrested and held without trial; two hundred Catholic men were interned and transferred to a ship in Belfast Lough. The killings continued into June. An IRA unit crossed the border and attacked Protestant residents in Altnaveigh and Lisdrumliska just outside Newry. Properties were bombed and burnt and six people were killed. 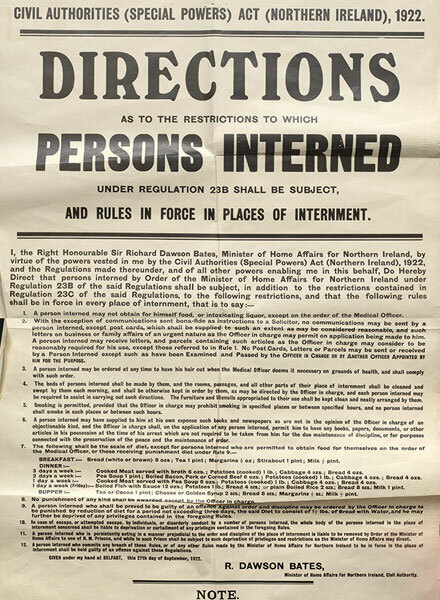 Civil Authorities (Special Powers) Act (NI) 1922 poster.